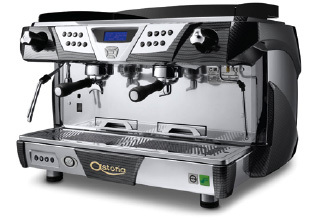 Astoria Plus 4 You is a machine from Astoria’s Green Line: these machines have a low environmental impact and can reduce consumption by up to 47.6%* compared to traditional coffee machines. Thanks to an innovative software that manages the automatic standby during operating pauses, the night Energy-saving feature and the intelligent adjustment of the temperatures, Plus 4 You distributes the power only where and when it is needed. Also, Plus 4 You automatically puts one or more groups into standby or “sleeping” mode when the work-load decreases and prepares them for full capacity when needed. If the barista needs all the groups to work, he can himself directly activate them from the keypad and they will be ready to operate at the programmed temperatures within 60 seconds. We thus have flexibility, constant and consistent performance as well as the highest quality in the cup with definite savings and benefits for the barista, the roaster and the environment. A resonant and powerful style and dynamic lines that alternate volumes and spaces as well as sensuous curves and imposing lines with a unique overall result: the design diffuses refinement and at the same time underlines the components of high technology that is the driving force of Plus 4 You. The keypad is backlit to facilitate the search for functions and it is set at a suitable ergonomic height on the work front to optimize, speed up and improve the barista’s operations. With only a few easy movements the barista can serve out all the requested drinks. The standard machine comes with a LED light that illuminates the working area and retractable raised cup grates for maximum versatility in all preparations. The display is placed in the centre of the controls area and allows the barista to program and see the main parameters of the machine. Its ergonomics follow the same approach as a common mobile phone thus making its use immediate and intuitive. A thermal control device allows Plus 4 You to combine maximum performance with the most suitable temperature. 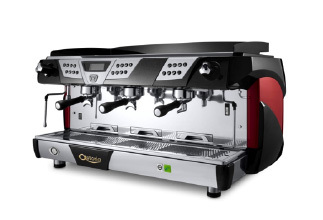 Simultaneously, the system compares the parameters of the single servings with pre-set optimal values and, based on the characteristics of the coffee being used, provides real-time information on the product in the cup. If coffee extraction is not perfect, Plus 4 You suggests on the display the appropriate corrective actions. Each brewing group has its own tank and so it is possible to adjust the machine at different temperatures for different coffee blends and thus always guarantee maximum stability and yield in the cup. Plus 4 You fully satisfies the needs of the roaster and of the barista. They will thus both guarantee their client an excellent product in the cup thanks to a machine that can be set up based on the characteristics of every blend of coffee. Modularity is one of the key concepts that identifies Plus 4 You: the steam boiler, the water reservoirs and the electronic control system allow independent operation of each group.